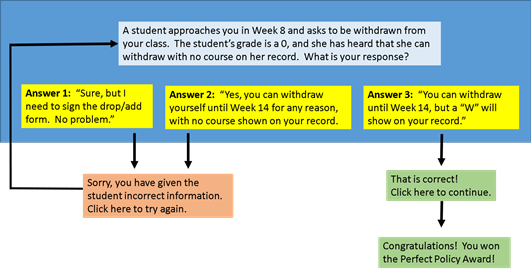 I was asked recently about creating branching scenarios for online learning, where students make choices and are guided to different screens based on their answers. One fairly simple option is to build the scenario in PowerPoint, publish it in iSpring (available at the CTE), and then share it with students in D2L. The result is an interactive learning activity that can take the form of a role play or even a multiple choice quiz. Step 3: Add the “branching.” Right click on one of the “Answer” boxes and select Insert Hyperlink. Under the Link to panel, select Place in this Document, and select the slide that has the result that corresponds to that choice. For example, in the “Answer 1” box, create a link to the “Sorry” slide. Step 4: Save the presentation and publish it in iSpring as an HTML5 file, and upload it to D2L. Click the presentation below to see the finished product using the methods outlined above. CTE Staff are available to help with this process. Email Meg Elias at clarkm1@star.lcc.edu, or visit our technology room in TLC 324 for assistance.